it's hard...and I would definitely miss all of you. but I don't have any choice but to say goodbye for now. I would no longer be posting in here since in a state that I am in now, posting about makeup and anything about vanity would be really inappropriate. I am sorry, dear readers. you've been with me for these past years...and you have encouraged me in every way you can to continue my passion with makeup. I will never forget all of you. Thanks, dear readers. I will surely miss all of you. To my fellow bloggers, I will continue reading your blogs, though. And one last thing, please pray for me that i'd be able to go thru my problems now. This was my post (edited it a bit) exactly 6 years ago...on April Fools' Day! So yes, I'm just kidding...I am not really saying goodbye. People thought I was really signing off from the blogosphere that I got a number of comments (even emails, text messages) after they read my post. I did leave a link at the bottom of that post to redirect them to my other blog so they could get more information on why I decided to bid goodbye. Nakakataba lang ng puso to know that despite my not so blogging-worthy posts, some people still read my blog. But honestly, I did think of leaving that time. Medyo emotera ang lola nyo those days. A few weeks ago, I was again having that emotera mode. Well, kelan ba hindi? And when I check my blog, I see that I don't get to update as often as I used to. I myself sometimes get bored on my posts, so I thought, how much more my readers. So again, the thought of saying goodbye to something I've been doing for almost 8 years crossed my mind. 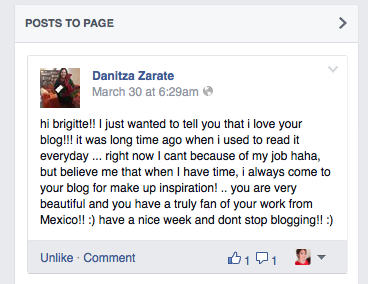 Danitza, you have no idea how much this means to me. I got teary-eyed after reading this. When things get rough and frustrating, I always think that I am a total failure, that I am at fault. So when I get messages like this, I feel like I am not. I feel like there is indeed something in my life that I am doing right. Mababaw siguro for some, but I feel more inspired to continue with blogging though I might not have as many readers/followers as the others or I might not get as much favours as I used to. My blogging started with my passion to share my love for anything about beauty. I didn't have sponsors when I started, but it didn't stop me from buying just to try out products and share my two-cents to my readers. Then after sometime, sponsors started pouring in and up until now, I am grateful to them. Now that I am here in the UAE, it feels like I am starting with my blog all over again but it's okay. As long as I know that there are people checking out my blog and as long as I still have something to share (not just about beauty but also food, travel, personal stuff), I'll be staying in this online space of mine. I just hope that you, my dear readers, won't get tired of visiting this site whenever you have time. Again, thank you and Happy April Fools' Day!